The USS FRANK CABLE (AS-40), an Emory S. Land-class submarine tender, was commissioned on 29 OCT 1979. FRANK CABLE was built in Seattle, Washington by Lockheed Shipbuilding and was homeported in Charleston, SC in the first increment of her career. For 16 years she tended the Charleston based attack submarines, then started decommissioning. 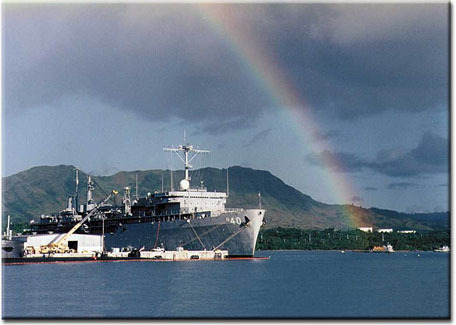 A revised plan had FRANK CABLE continuing in service after an upgrade, at Apra Harbor, Guam. Arriving in 1997, FRANK CABLE has tended the submarine of the Pacific Fleet from her homeport and has ventured to Siapan, Pearl Harbor, Yokouska, Japan, Port Kelang, Malaysia, Hong Kong, Vladivostok, Russia and Subic Bay, Phillipines. In 2010 USS FRANK CABLE was transferred to the Military Sealift command - without the usual "T-" designation. In an arrangement used so far by just USS FRANK CABLE, USS EMORY LAND and USS MOUNT WHITNEY, she remains a commissioned US Navy vessel and with a a mixed civilian/Navy complement, under U.S. Navy command.